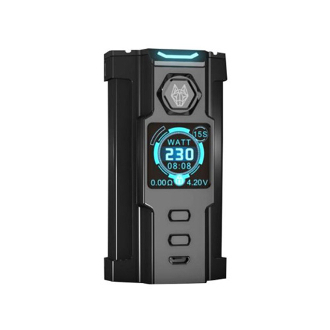 The SnowWolf Vfeng 230W TC Box Mod has a unique and futuristic design. Along with a robotic image is the mechanisms and features of a high tech piece of technology. It takes two 18650 batteries to power its 230Watts and LED Color displays. There is a 1.3 inch display screen that shows a large array of things including the basics such as battery life, ohm resistance, settings, mode, and wattage/temperature output.